N.B. : this article uses the TLA ‘TCP’ where it appears TPC would be correct. “Of the 43% of households owing no federal income tax this year, about half simply earned too little income to qualify, including many retired workers who live on Social Security. The remaining households likely qualify for breaks via the Earned Income Tax Credit and the Child Tax Credit. 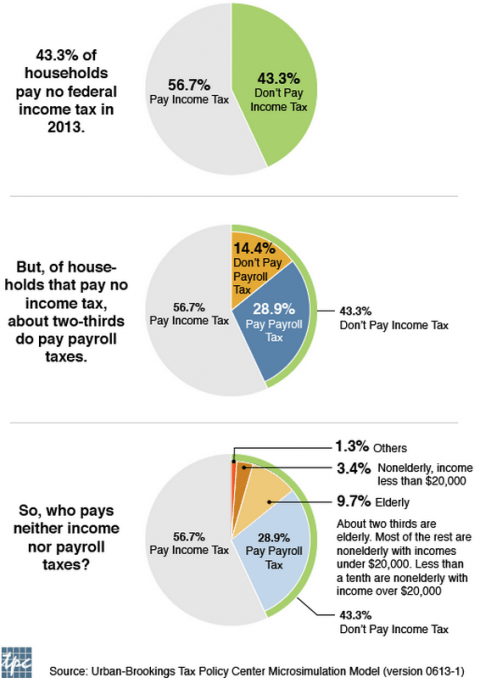 Since 2009, the percentage of Americans who pay no federal income taxes has fallen from 47% to 43%, according to a recent report by the Tax Policy Center. The catalyst for the drop is due to two factors — federal tax cuts that expired after the Great Recession and an improving economy. Last year, TPC’s 2009 estimate might have been the nail in the coffin for Mitt Romney‘s ill-fated bid for the Presidency after he criticized the “47%” of Americans who don’t pay federal income taxes at a fundraiser. Like Romney, a lot of people assumed that these households were getting off tax-free across the board. That wasn’t the case then and it’s certainly not the case now. “The notoriety of the 47 percent figure has come largely from a misunderstanding—or less charitably, a misrepresentation—of what that number actually means,” writes Robert Williams of the TCP. Thanks to payroll taxes, it’s nearly impossible to get away completely tax-free today. In fact, “just 14% of households pay neither income nor payroll tax and two-thirds of them are elderly,” according to the TCP. And then there are taxes closer to home to consider. You’d be hard-pressed to find households who don’t get hit with state or local income, sales, and property taxes. Of the 43% of households owing no federal income tax this year, about half simply earned too little income to qualify, including many retired workers who live on Social Security. The remaining households likely qualify for breaks via the Earned Income Tax Credit and the Child Tax Credit. Mandi Woodruff edits the personal finance vertical for Business Insider. Before joining BI, she covered breaking legal news for Law360.com, was a research editor at Reader’s Digest, and reported on education in her home state of Georgia.